The scientists gathered data from 621 men with prostate cancer and 872 men who were cancer-free. They interviewed the men about their meal timing and sleep habits. Then they did the same with women. Their female study group included 1,205 cases of breast cancer and 1,321 cancer-free women. After analyzing the data and adjusting for other factors like smoking and age, they discovered that the timing of the last meal of the day was directly linked to subjects’ cancer risk. Specifically, having the evening meal before 9 p.m. or waiting at least two hours after dinner to go to bed lowered the risk of prostate and breast cancers by 20%. Dr. Manolis Kogevinas is lead author of the study. He is head of the Cancer Program at Barcelona Institute for Global Health. Both breast and prostate cancers have previously been linked to the disruption of the circadian rhythm. This is the natural “body clock” that tells our bodies when to sleep, wake up, and eat. The researchers theorize that when the people eat dinner late or go to bed soon after eating, they upset the natural circadian rhythm of their bodies. The obvious lesson from the study is to eat dinner earlier. And don’t fall asleep right after. But some people prefer to eat late because they suffer from hunger at night if they don’t. 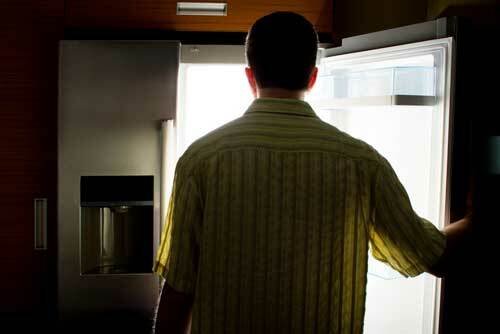 If they eat earlier, they are prone to late night snacking. If that’s you, add fiber and protein to your dinners. They will make you feel fuller longer. Stay away from carbs at dinner. They can cause blood sugar spikes that lead to hunger pangs.